Ash from an explosive event at Halema‘uma‘u on May 15, 2018, was blown by trade winds to the southwest, where it fell from the plume and blanketed the Kaʻū Desert landscape. Samples of this ash were collected for ash leachate analyses as part of the assessment of hazards from Kīlauea Volcano’s eruption. Click to enlarge. PC: USGS photo by S. Brantley. 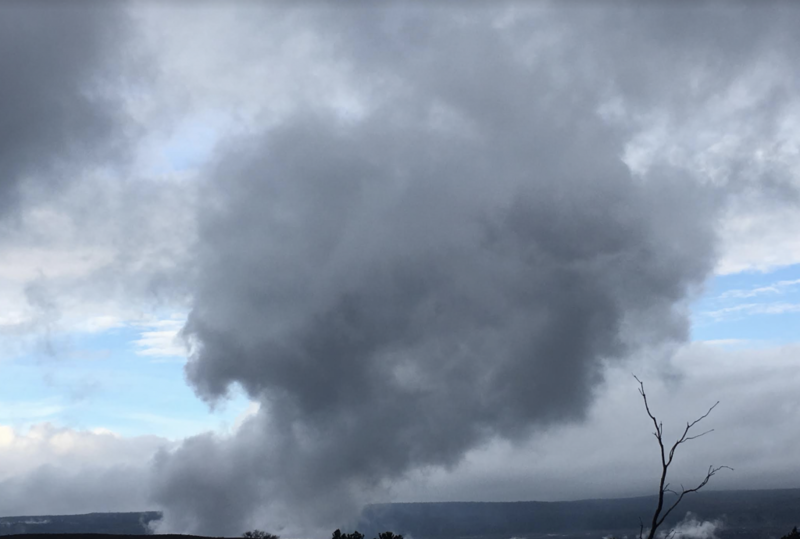 Sulfur dioxide (SO2)-rich emissions have long been a feature of Kīlauea Volcano’s summit activity. However, vigorous volcanic ash production during the 2018 eruption raised new concerns about potential impacts for downwind communities. During an eruption, chemical reactions that occur between volcanic ash and the SO2-rich plume form salt coatings on the surfaces of ash particles. These coatings contain a wide range of components that are soluble (easily dissolved). Upon contact with water, either through ash falling into water catchments or by rain falling on ash, the soluble components are washed from the ash. This can impact human and agricultural activities, both positively (if ash supplies nutrient elements, such as sulfur, to soil) and negatively (if ash can release potentially toxic species, such as fluoride). The composition of the ash coating can be measured in the laboratory through ash leaching experiments. This is performed by mixing samples of freshly erupted volcanic ash with ultrapure water and measuring the change in the water chemistry. 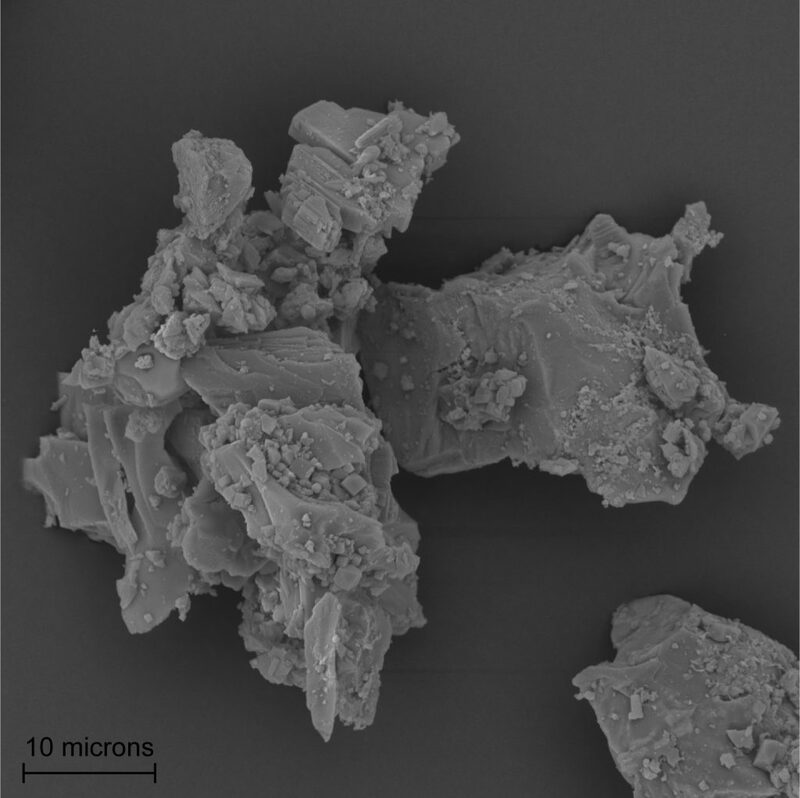 This close-up image (5000x magnification) of a Kīlauea volcanic ash sample collected on May 23, 2018, was captured by a scanning electron microscope. Visible on the ash surface are tiny salt crystals that can be leached from the ash. Most of the salts in this image are aluminum sodium sulfate and calcium sulfate. This image is about 50 microns across, which is half of the width of a human hair. PC: USGS photo by D. Damby. These “leachate” results from the laboratory can then be scaled with the amount of ashfall to evaluate the potential impact on water resources, agriculture, and human health. If the ash coating poses a hazard, then appropriate protective actions can be communicated. Determining the composition of ash surface coatings through ash leaching is a valuable part of the volcanic hazard assessment carried out by the U.S. Geological Survey. 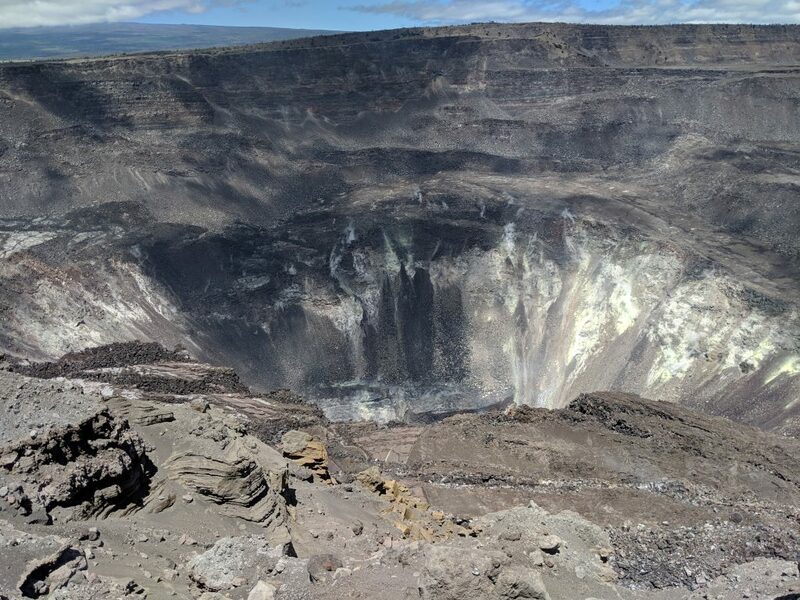 With the help of citizen scientists, the USGS collected and analyzed almost 30 ash samples produced by collapse events at the summit of Kīlauea in 2018. All data are available online from the USGS. Contamination of drinking water by fluoride is of primary concern for human health. Some good news is that recent ashfall at Kīlauea did not contribute sufficient fluoride to water catchment systems to cause adverse health effects. In fact, it was determined to be at least ten times lower than the maximum contaminant level (MCL) goal set by the U.S. Environmental Protection Agency (EPA). This is the level at which no known adverse human health effects occur. The concentration of fluoride on ash from the recent activity of Kīlauea is below 100 milligrams of fluoride per kilogram of ash. This is lower than the average for other eruptions worldwide (129 mg F per kg ash). Leachates from Kīlauea ash contain a tremendous amount of sulfur, exceeding anything measured at previous eruptions from volcanoes around the world. This may not be surprising given the massive output of SO2 throughout Kīlauea’s eruption. Some of the Kīlauea ash samples had nearly 25,000 milligrams of sulfur per kilogram of ash, which is over 2 teaspoons of native sulfur for every pound of ash! The impact of this sulfur on drinking water in Hawai‘i is largely aesthetic, affecting taste only. Concentrations were still below the EPA MCL despite the remarkable amount of sulfur on the ash surfaces. Only manganese, aluminum, and iron were measured on the ash at concentrations that may reach defined EPA thresholds for causing undesirable taste and color of water. However, the concentrations are not a threat to health. Although the hazard to humans is low, grazing animals can experience nutritional deficiencies from ingesting high amounts of sulfur, and fluoride exposures can result in the erosion of teeth, loss of bone, and other growth abnormalities. Accordingly, recommendations for protecting livestock were issued by the University of Hawaiʻi at Mānoa’s College of Tropical Agriculture and Human Resources. Advice on maintaining water catchments systems and guidance on living with ashfall, in general, are available on the Hawaiʻi Interagency Vog Information Dashboard. 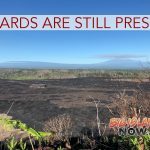 Previous Volcano Watch articles have addressed protecting yourself from Kīlauea ash (June 7, 2018), and the many forms of sulfur found on Kīlauea (July 13, 2018). Kīlauea is not erupting. Summit and East Rift Zone activity is greatly reduced, with low rates of seismicity, deformation, and gas emissions recorded this past week. Small earthquakes (generally less than magnitude-2.5) continue at Kīlauea’s summit. As expected, small aftershocks of the May 4th magnitude-6.9 earthquake continue on the volcano’s south flank. Sulfur dioxide (SO2) emissions across Kīlauea remain drastically reduced, with a combined rate of less than 300 tonnes/day. Small amounts of hydrogen sulfide gas (H2S) are also being released in cooler, wetter volcanic environments, and from decaying vegetation and other organic matter. The human nose is extremely sensitive to the “rotten egg” smell of H2S; some people can detect this gas at less than 0.001 parts per million. Residents have reported smelling H2S downwind of Kīlauea, but these concentrations are well below hazardous levels. More information is available online. The USGS Volcano Alert level for Mauna Loa remains at NORMAL. Since late September, two recurring groups of microearthquakes have been recorded beneath the upper elevations of Mauna Loa Volcano: (1) a shallow cluster between Moku‘āweoweo caldera and the uppermost Southwest Rift Zone, and (2) a slightly deeper cluster centered beneath the upper west flank, roughly 3 to 6 miles from the summit caldera. The largest of these earthquakes—magnitudes 3.4 and 3.6 on Sept. 30 and Oct. 8—have been in the western cluster. Because there have been no changes in deformation or gas emissions that would indicate shallowing of magma, these microearthquakes do not warrant increased concern about potential eruption. HVO continues to closely watch this seismicity and monitor the volcano for any other changes. 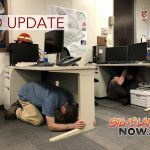 Two earthquakes with three or more felt reports occurred in Hawai‘i this past week: a magnitude-3.1 quake 10 miles southeast of Volcano at 4 miles depth on Oct. 17 at 1:59 p.m.; and a magnitude-3.3 quake 6 miles northwest of Volcano at 6 miles depth on Oct. 12 at 12:51 a.m.
Volcano Watch is a weekly article and activity update written by U.S. Geological Survey Hawaiian Volcano Observatory scientists and affiliates. 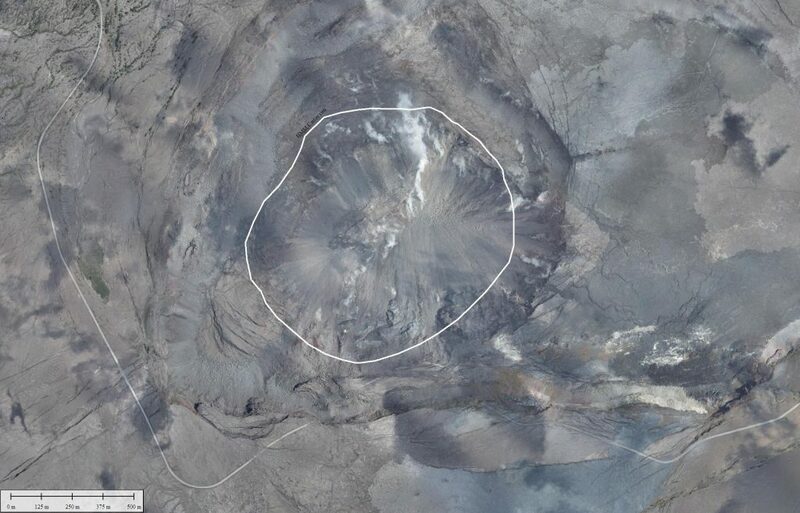 Today’s article is by USGS California Volcano Observatory research chemist David Damby.